Critical reading to understand nearly all of mainstream media and a good portion of ‘alternative’ media. Arguably, Edward Bernays has done as much to destroy the human spirit in society, in just a few short generations, as the church at Rome had accomplished in two millennia. Although often taken with a sinister connotation in modern usage, the original meaning of the word propaganda is better described today by the swath of professions encompassing the field of Public Relations. Lobbyists, marketing professionals, media consultants, political pundits, and public affairs liaisons, are just a few examples of the modern professions that have become critical to the success of any organization that must navigate the unsure waters of public opinion. As the profession of public relations has grown and diversified, the language it uses to describe itself has diversified as well; what would have been called propaganda a century ago is now message management, product marketing, promotional advertising, press releases, off the record, official statements, and most recently; spin. What unites these terms is a focused attempt at capturing the public interest towards some broader goal; sales of a particular product, support for a political candidate, advancement of a religious ideology, or the systematic violation of basic human rights. Public Relations as a profession and field of study rose to prominence in the U.S. following the success of the Committee on Public Information (“CPI”), commonly known as the Creel Commission, an agency of the federal government established and then later dismantled by President Woodrow Wilson to build public support and enthusiasm for U.S. participation in World War 1. Widely seen as extremely successful, the efforts of the CPI caught the attention of business and political leaders who began to turn to the newly developed concept of a Public Relations Counsel for assistance in manipulating public interest. As a member of the Creel Commission, Edward Bernays developed the skills he would later use to launch the field of public relations as a professional discipline. Supreme Court Justice Felix Frankfurter called Edward Bernays and his contemporary and competitor, Ivy Lee, “professional poisoners of the public mind, exploiters of foolishness, fanaticism and self interest.” Edward Bernays in particular deserves credit for much of the intellectual roots of modern public relations as his academic writings still encompass much of the theory in use today. The ethical basis that under-girds the profession of public relations as put forth by Bernays contains no reference to any known or accepted ethical theory beyond a tepid comparison with the medical and legal professions. When taken collectively Bernays arguments for the ethical basis of the field of public relations represents at best a loosely utilitarian ethic; grounded only in self-interest and the maintenance and furthering of a career in public relations. A comparison of the ethical foundation of the legal profession with that of public relations is dubious at best. As he notes himself, Edward Bernays argument glosses over perhaps the most critical difference; that in a court of law, or any legal proceeding for that matter, there is some impartial third party ensuring that the “spin” being put on the facts maintains some subjective basis in reality. The framework offered by Bernays contains no impartial third party keeping the PR man honest beyond the ability of his conscience to weigh his own self-interest and those of his clients against the greater public good. His comparison does not compare favorably with the Hippocratic oath of “first do no harm” that under-girds the ethical framework of the medical establishment; instead the only criteria for adherence to this code are that the PR professional have some level of belief in the product/service/initiative being promoted, and that he or she avoid tainting their public good name by association with fraudulent products or antisocial purposes. The parallels Bernays draws between the ethical codes of the legal and medical communities with public relations is without merit because these professions are subject to strict codes of conduct that often carry legal and professional consequences if not strictly adhered to; this is not the case with public relations. The profession of public relations has no such governing body that determines the ethical grounding of a PR initiative beyond public acceptance of the position being offered. Instead of a strictly codified set of rules his ethical framework simply calls upon the PR professional to use his or her own subjective judgment in determining whether or not a particular course of action is ethical. According to Bernays, the right to petition others to adopt a favorable viewpoint is central to the function of a free and open society and accordingly the effective use of public relations is the grease that allows the wheels of democracy to turn; where persuasion and guile has usurped raw authority as the prime impetus for social action of any kind, whether it be corporate, government, or private interests at stake. The “engineering of consent” according to Bernays is required in a free society to direct and form the public support required to accomplish any goal; this is, he argues, because the average citizen is individually and collectively mentally ill equipped to grasp let alone make intelligent choices regarding the intricate issues that face leaders of any kind within a modern society. In making his case for the necessity of public relations Bernays explicitly questions one of the important arguments used in furthering democratic forms of government and one explicitly labeled as critical to those ends by many of the founding fathers of the United States. The constitutional protections afforded a free press and the rights to free speech were not envisaged as a freedom to spin and manipulate by the founding fathers. But rather as protection against interference with the unfettered ability of the public to disseminate the facts surrounding government policy and government action; that given access to these facts citizens could decide for themselves the just or unjust nature of government. For Bernays the idea of an enlightened and informed citizenry capable of making intelligent and informed decisions constitutes is little more than a pretty sentiment. Access to these “rubber stamps” is required when initiating action of any kind in need of a broad base of public support and according to Bernays the public intellect is the last place in which access to them will be found. Bernays argues that propaganda is most effective when directed by scientific (e.g. empirically proven mainly psychological) methodologies aimed at manipulating the emotions, prejudices, preconceptions, social relationships, and unconscious habits of the target audience to bring about a change in or the adoption of a particular viewpoint or call to action. Bernays then asserts that information is power and that those who can manipulate the modern machinery of communication, which is primarily a conduit for the flow of information, can manipulate society as a whole. That financial means gives access to outsized influence over a free and democratic society is a basic premise put forth by Bernays in making the case for public relations as a profession. The confluence of financial means with power over information constitutes what Bernays calls an “invisible government” that arises informally around those with influence over and access to information either through means of keen intellect, prominent position, or sheer financial muscle. He argues that this unseen influence, enabled largely through the skillful exploitation and manipulation of information, is what provides a free society with a stable ruling class absent the strict hierarchical authority structure in other less free forms of human governance. It is the job of this informal and amorphous “invisible government” comprised of overlapping spheres of influence, intellect, and financial clout to make important decisions on matters pertaining to the public good. Once these decisions have been made it is the job of the PR professional to go about scientifically and methodically deconstructing if public support can be obtained for the measure under consideration. Focus groups, market research, surveys, and public opinion polling are modern examples of this scientific deconstruction at work. If the plan under consideration is deemed sellable, a process of what amounts to a professional and very thorough scientific manipulation of the target population is undertaken in an effort to win public support for an idea, program, goal, election candidate, or genocide. This process features at its center an appeal to the irrational meant to move a target audience in a chosen direction through indirect, i.e. manipulative, means; via an appeal to the intellect and understanding of the audience. Consequently the ultimate measure of success in public relations is achieving movement in the desired direction without the subject even being consciously aware of his or her shift in perception. When viewed collectively Bernays’ argument for the necessity and place of public relations within a democracy results in at best a form of enlightened despotism; where those in key positions of influence decide on matters of import and turn to the public relations profession to win public support through manipulation and guile rather than an informed conversation with an involved citizenry. When consent is engineered through these methods the end result is artificial; something that did not previously exist or come about organically and is not natively integrated with the host population has been unleashed via overt manipulation. The end result of is often catastrophic and unpredictable for the subjects of these machinations. This is at the heart of what makes Bernays vision of public relations ethically dubious and antithetical to the function of a democratic and free people; he denies the average citizen true franchise and attributes to a lack of intellect the universal human response to strong visual, emotional, and psychological stimuli. Extreme examples of evil such as Goebbels use of Bernays writings in Nazi Germany to build support for the persecution and eventual extermination of the Jews or the demonizing of Bosnian Croats and Muslims by the Milosevic regime are rare examples of accountability. The events perpetrated by these individuals and their accomplices within media and government illustrate exactly how dangerous it can be to engage in the mass manipulation of society through the use of Bernays style public relations tactics. Lesser transgressions in spin are generally overlooked or labeled as “reasonable people can disagree”; the rampant and overt consent engineering directed at the American public by the Bush Administration in the lead up to the Iraq war is a good example of this slippery dynamic. 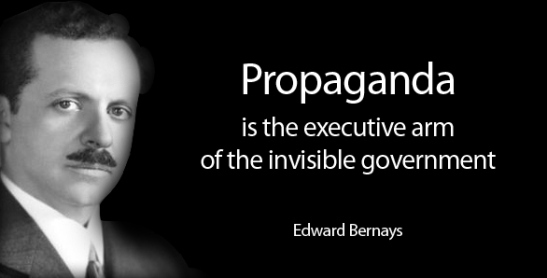 Bernays emphasizes the use of facts as central to the effective use of public relations tactics; he held that facts when coupled with the proper packaging and directed at the emotional/psychological aspect of man was the most effective means of procuring public support for any endeavor. The selective use of facts by the Bush administration in Iraq represents a textbook employment of Bernays public relations methods . The invocation of a “mushroom cloud” as the smoking gun that would attend the failure to contain the regime of Saddam Hussein resonated with a US population steeped in Cold War imagery of an atomic holocaust and primed for action following the traumatic events of September 11th 2001. As Bernays advocated; an appeal to emotion, fear, the irrational and subconscious enabled by the selective use of facts paired with an interpretation geared towards a specific outcome was an effective means of gaining public support for preemptive war. The coupling of overtly manipulative tactics aimed at what Bernays cousin and mentor Sigmund Freud called the “irrational nature of man” with an outlook that views collective humanity with a degree of intellectual contempt has set the tone for a century of public relations practices. This unfortunate precedent permeates modern public relations and it is my belief that it is contributing at a fundamental level to the increase in public distrust and disillusionment with large powerful organizations of any kind, be they government, private, commercial, non-profit, religious, or secular. The pervasive use of public relations tactics as embodied by Edward Bernays becomes particularly problematic when in unholy trifecta with the National Defense and National Intelligence communities. The overtly manipulative practices advocated by Bernays can, and in a free society should, only be contradicted by complete access to the facts used to formulate the position being put forth for public consumption. This crossroads of secrecy and a culture pervaded by public relations and the temptation to and acceptance of “spin” as a viable way out of difficult decisions leaves the average citizen not only in the dark about the behavior of the US defense and intelligence establishments but government as a whole. Given that the defense and intelligence communities under current laws retain the right to classify information for decades if not indefinitely this leaves the average US Citizen in a position of enforced ignorance with regards to the actions of his or her government in contemporary matters of national defense and intelligence collection. Without access to the facts surrounding a given issue the citizen is completely at the mercy of the consent engineer; whose job it is to steer them in a chosen direction through manipulation and guile on behalf of those who purportedly know and are better equipped to understand the issues at hand. When the source of engineered consent is the government of the United States which wields more financial muscle and informational might than any other single entity in existence little can be done to forestall these tactics when the facts that would illuminate falsehood, artificiality, and bias are closely guarded secrets. Bernays argument for the necessity of public relations within a democracy is shockingly undemocratic because it undercuts the very heart of what constitutes a free and open society and does so through the use of covert and overt manipulation. His argument for the place of public relations within a modern society would reduce the average citizen to an emotional punching bag subject to the constant manipulation of public relations personnel; whose job it is to stimulate in the herd the proper and needed response. The pervasive nature of public relations in modern society is creating a self-fulfilling prophecy where constant appeals to base instinct and emotion from every conceivable direction are creating a fishbowl of lies in which the American people swim; robbed of the intellectual capacity to make intelligent choices as informed citizens because they are not at the most basic level being allowed to participate. Examples of this dynamic are found in the deposing of legitimately elected leaders in foreign countries on behalf of US economic interests in places like Guatemala, where United Fruit’s banana monopoly was under threat; or in Iran where the duly elected president Mohammed Mossadeq promised to nationalize the oil industry which was perceived as a threat to US and European economic interests. In both of these examples public relations tactics were used to spin US actions in these countries as primarily geared toward undercutting the communist threat posed by an expansive Soviet Union during the cold war. This artificiality was spun from the cloth of Edward Bernays public relations playbook and left the public in large part ignorant of the full scope of US interests in deposing legitimately elected foreign leaders. US actions in foreign coups were justified nearly completely on the basis of covert action against Soviet expansion during the cold war. After the fact examination of these incidents has revealed the artificiality of the justifications at issue, but this is far too late to effect policy decisions that have been the source of substantial blow-back for the US in both Latin America and the Middle East. Unless coupled with full and contemporaneous access to the facts under-girding the policy position being pursued, the use of manipulative public relations tactics that play to the base instincts of a population is unethical to a truly free democratic society. These tactics when used by the government of that society to engineer outcomes outside of full public view is when the practice become not only unethical but abhorrent and smacks uncomfortably of paternalistic despotism. The relative frequency with which the US public is bombarded with cryptic warnings and carefully packaged statements supporting activities from raw intelligence collection, to unmanned drone strikes, and even outright invasions serves to indicate that these tactics are thriving even today. With the death of Osama Bin Laden the national defense establishment has been busily constructing a strong justification for massive investments in “cyber warfare” technologies as the next profit maker as the war on terror cooled down (but since reheated with policies resulting in the rise of IS.) This effort is showing many of the same signs of consent engineering that are evident after the fact when examining the Bush Administration effort to sell the public and world at large on preemptive war in Iraq. Perhaps in addition to being known as the father of public relations Edward Bernays also deserves some substantial credit for popularizing the “sheeple” or people as sheep argument; that as a collective humans are no more capable of processing complex ideas than a herd of domesticated animals. Subtle variations on this argument are often used to defend the status quo in our national policies where only those with access to restricted information are allowed, at a functional level, to make critical decisions in these areas. This in and of itself would not be a problem if decoupled from an approach to public relations that relies on fear and manipulationrather than an appeal to the intellect and an attempt to expand the understanding of the American people with regards to the issue under consideration. The widespread use of manipulative public relations tactics on behalf of the US Government when directed towards its own people will continue to be a blatantly unethical violation of the spirit of, if not the letter of, the intent our founding fathers had in drafting the documents that form the basis of our political tradition. When viewed in this light the modern field of public relations as it is currently practiced is ethically fraught through the use of dubious tactics of manipulation and guile even when the public has access to the facts at hand. Without full and contemporaneous access to the factual basis undergirding a government sponsored consent engineering, effort the modern practice of public relations represents a real and persistent threat to free and democratic forms of governance that place the accountability of the rulers in the hands of the ruled. This is because without access to the complete informational picture used to formulate particular government policy the citizen is denied franchise through an inability to discern spin and fear mongering from fact and legitimate existential threat. This enforced ignorance ensures that a propagation of the status quo will necessarily result in a population ill prepared to make tough decisions in a complex world, as they have been shut out of the real conversation. Jefferson amongst other founding fathers of the United States held that an enlightened and informed citizenry is the only safekeeping afforded the liberties, freedoms, and property of a democratic society. Edward Bernays turns this argument on its head and gives shockingly little credit to the ability of the average citizen to decide for themselves the best course of action in a given situation, and in so doing sows the seeds of demagoguery and despotism achieved through power, financial means, and the skillful manipulation of information directed at herding the public in a desired direction. From the standpoint of utilitarian ethics, in a true democracy, only the people are allowed to decide what is in their own best interest; and this is a premise Bernays explicitly rejects; it would seem many of Bernays’ contemporary intellectual heirs see it his way too.